For those who have been scouring the App Store for an app that makes Gmail usable on iOS or have been sulking since Google bought out the best alternative email app in Sparrow and has sparsely updated it since the July purchase, you can finally return to the source of the problem. Google got around to updating its iOS app to Gmail 2.0 today. Six months of development seems to have paid off, as the app offers a new design and some heavily requested features. 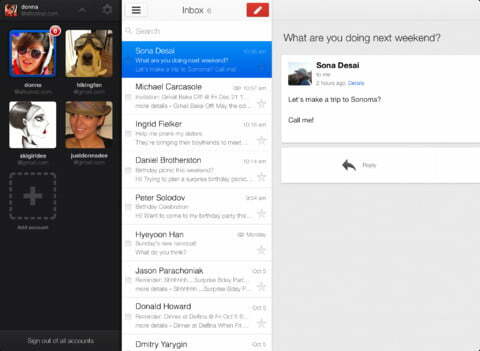 The project manager for the Gmail iOS app, Matthew Izatt, laid out what users can expect with the update in a blog post. “You’ll get a totally new look and feel, plus a bunch of improvements like profile pictures in messages, numerous new animations from swivels to transitions and infinite scrolling in the message lists,” Izatt stated. A clear effort was made by the Google team to make the Gmail app look and feel like a whole new experience, which is needed after the bad taste the old versions have likely left in the mouth of users. More than just looks, Gmail 2.0 on iOS also brings plenty of functions that were previously missing. The ability to manage up to five Gmail accounts within the app promises to give folks with multiple inboxes the access they crave. Integration between Gmail and other Google products have also been included, further immersing users into a Google-made universe. “You can RSVP to Google Calendar invites as well as +1 and comment on Google+ posts directly from the app,” Izatt detailed on the Gmail Blog. Following the Gmail Android app update and an update to Google Drive on both Android and iOS, it appears that Google is definitely committing more resources to its mobile offerings. 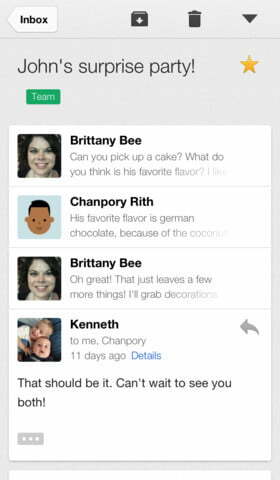 The Gmail app shows the company is learning–or at least taking the best ideas from the companies it buys out. Either way, the changes are more than welcome.